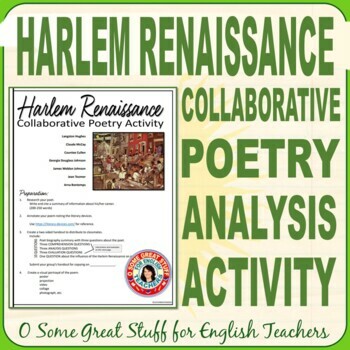 Students find this exploration of Harlem Renaissance poets both challenging and fun. 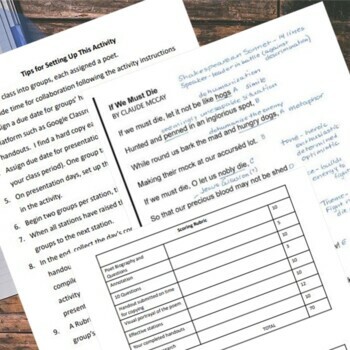 Collaboration creates confidence as students research poet biographies, annotate poems, generate handouts and questions for their classmates, create visual representations of poems, and man expert stations to guide peers through their poet’s work. You can add or remove poems from the packet as you wish. Students travel in their groups from station to station where experts discuss the poem and handout questions. 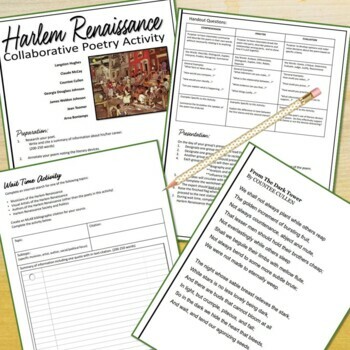 There is an activity to complete during their “wait time.” This activity has students choose a musician, artist, or author of the Harlem Renaissance, research, and provide a summary. My students have iPads; if yours do not you can provide books or encyclopedias for them to work with. 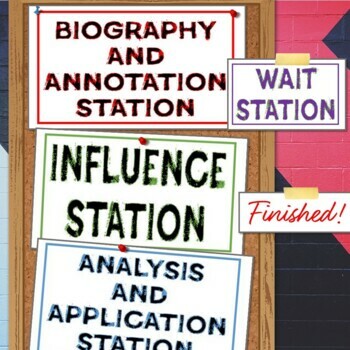 Also included in this resource are station signs and “finished” flags. I’ve included an annotated version of each of the poems as a teacher guide and tips for setting up the activity. Please look at the preview to see the resource. Thank you for your consideration of this resource. ⭐ HARLEM RENAISSANCE Claude McKay "The Tropics of New York"
•	Please go to your My Purchases page (you may need to login). Beside each purchase you'll see a Provide Feedback button; click it, and you will be taken to a page where you can give a quick rating and leave a short comment for the product. Each time you give feedback, TPT gives you feedback credits that you use to lower the cost of your future purchases. I appreciate your feedback; it helps me determine which products are most valuable for your classroom.